I LOVE the costumes the celebrities put together for Halloween. Heidi Klum has been one of my favorites in the recent years. This year Heidi Klum is hosting Halloween parties in both Las Vegas and New York (where she’s making Tim Gunn join her, also in costume). For her respective engagements, she appears to be dressing up as a glamorous cadaver from the “Bodies” exhibition and a combination of tabloid legend Bat Boy and a Game of Thrones wildling. Check out some pics of her costumes below. Arriving to a party in a bed has got to be the most comfortable way to enter thus far. No details spared. Look at the medical escorts. The "blood" on the sheets. 2. Mix cake mix, pudding mix, sour cream, oil, eggs and vanilla with a mixer for two minutes until fully incorporated. 3. Fill 24 lined cupcake molds 2/3 full. Cut 12 Snickers miniatures in half so that you’ve got 24 pieces. 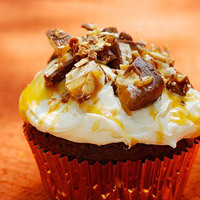 Push one frozen Snickers half gently into each cupcake and make sure batter covers the candy entirely. 4. Bake for 18 to 22 minutes, or until middle of cupcakes are set. Let cool. 5. Mix frosting, caramel and salt with mixer until just combined. 6. Frost cooled cupcakes and drizzle with caramel. 7. Chop remaining 12 Snickers into small pieces to sprinkle on cupcakes and serve. Makes 24 cupcakes. Which other holiday do we have where kids and adults can both be kids again. Dressing up in your alter ego and acting super silly. Kids love Halloween for that reason + the fact they get to go trick or treating and suddenly WHOA – all that stuff that us parents give as a treat once in awhile comes PLENTIFUL. Halloween for some parents, nutritionist and some dentist, it just downright scary! What candy camp your family falls in – there’s more to do with candy then just eat it. Check out some ideas and tell us some of yours on what to do with leftovers. 1) Recycle it. Screen the candy your kids bring home and instead of throwing away any unwrapped goodies, take out any candy your don’t like or you don’t want them to have and send that candy back out the door with other trick-or-treaters. 2) Freeze it. Chocolate bars take longer to eat, so children can’t wolf that down so quickly. 3) Bake it. u don’t have to freeze the candy to keep it fresh. Kept in an airtight container, it will last long after Halloween. Later, you can bake surprise cupcakes. Push a soft candy into the middle of the batter in each cup before baking. Decorate the icing with more candies. You can also substitute bits of chocolate bars in your favorite chocolate-chip cookie recipe. 4) Melt it. Save chocolate to bring a taste of summer into your home long after you’ve put away the sunscreen. Melt chocolate for s’mores any time of year. Place a chocolate bar and a marshmallow between two graham crackers on top of a paper towel. Microwave for about 20 seconds. 5) Create it. Professional artists create sculptures from candy, why not kids? Make mosaics with hard candy. Cover sturdy cardboard with wax paper, aluminum foil or paper. Then instead of tiles, use candy to create a design and “grout” it with stiff icing. To make sculptures, stick soft candy, apples and marshmallows together with toothpicks. 6) Decorate it.Create Christmas ornaments from candy. To make a train, take a long pack of gum and glue on round candy for wheels, a square piece for a smokestack, and something round for the bell on top. Attach a loop of gold thread or ribbon for hanging. Look at simple geometric illustrations (such as are in coloring books) for other ideas. Coat your ornament with an acrylic sealer so it won’t deteriorate and you don’t draw bugs. 7) Share it. Take your leftover candy to the office. Even if your co-workers who are parents are sick of the stuff, chances are your younger colleagues will relish childhood memories as they reach for another Mary Jane or Butterfinger. Halloween on a weekday for working parents is always a little bit harder, but here’s a guide from Time Out NY Kids that can hopefully simply your life easier. Click on the picture below to get to the link. Save 25% on Leapfrog items at Toys R Us. If you’ve stated to Holiday Shop, this is an AWESOME deal. If you’re starting to holiday shop, here’s a great deal that I came across. Disney Personalized Fleece Throws for $9.37. There’s a few characters to choose from, for girls and boys. The blanket is currently on sale for $12.50. If you enter FREENAME at check out, you get name for free and free shipping! And to top that off enter GIFT25 to receive additional 25% off. Awesome find I must say. Going on for just this weekend, you can receive 40% off your purchase at Banana Republic (in store only). This is a great deal! Hurry before it’s over! No coupon needed! Happy shopping! Head over to an Old Navy near you and get a costume for your kids for just $5…whether it’s last minute one or for the upcoming holidays, this is a steal! If you are also a member, this weekend is also Stuff & Save! Hurry before styles and sizes run out. Quinton leather mini skirt at French Connection.